VTX with a DNA250C chip for like $10 more? Worked great right out the box. Can someone explain the chipset on the Topside Dual and explain how it can give you 12v on 2x18650s. I’ve seen that posted on two different vendor sites and my mind can’t convert the math. Not sure how it works but through some electronic witchcraft it boosts the voltage. Pretty sure its not a new thing. Yesterday I received two more squonk mods in the mail, the BF just wasn’t doing. Got the Pico Squeeze 2 and the Sig 213 squonk. Love them even though I’m having a few issues getting the Pico going. 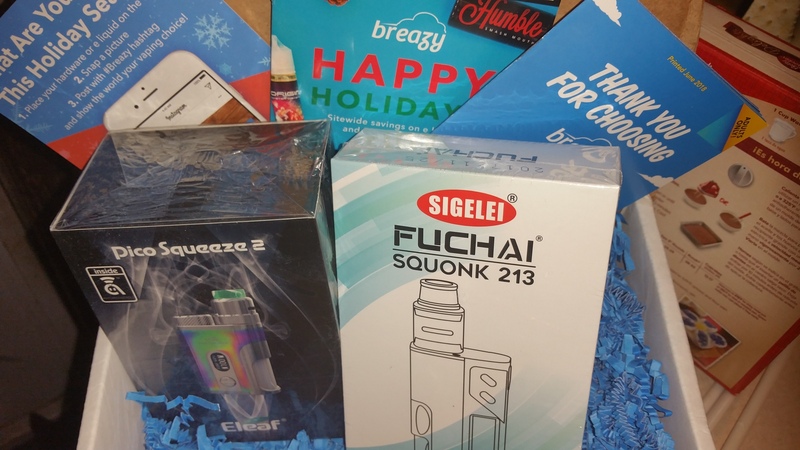 I see the Sigelei will need a bigger battery then the 18650 though. Yes, I used to have the Sig 150 and I loved it. Until it hit the highway going about 60mph. Never recovered it. Sigh. This one just needs a bigger battery and will be ok. The Pico I love so far. It does have an issue in wattage mode, looking into that now. But so far it’s a pretty nice mod for what it is. Battery on it keeps on going like the old iStick I had many moons ago. Pretty happy with the overall purchase as they will be good for out and about. Puts an end to needing to bring alot of bottles. I’m researching the best 21700 batteries now. Decisions, decisions… Great post. Thank you for directing me to that. I’m just underpowered on the 18650. The TC I haven’t even tried. I’m using the preheat function now on wattage. According to Mooch, our battery expert, the best 21700s are Samsung 30Ts for mechs and 40Ts for regulated.